An utterly scrumptious concept that everyone will love. Tailor each package to the individual, and feel free to add your own favourites, such as fried mushrooms or black pudding. Take the eggs out of the fridge a good half an hour before you make the pancakes so that they are at room temperature. Cook the bacon and sausages according to the pack instructions. Then split the sausages in two lengthways and cut the bacon into large pieces and keep warm. Meanwhile, to make the pancakes, sift the plain flour into a bowl, then stir in the malthouse flour and salt. Make a well in the centre of the flour and add the egg. Mix the milk with 300ml cold water, then gradually whisk into the flour and egg. Add enough to give it the consistency of single cream (you may not need it all). Beat in the butter. Heat a 25cm heavy-based frying pan or flat griddle over a moderately high heat. Dip a wad of kitchen paper into oil and carefully wipe over the surface of the pan. Drip a spot or two of batter into the pan - if it sets immediately then it's hot enough. Pour a ladleful of batter into the pan and tilt to allow it to spread over the pan. Cook until lightly browned underneath, then flip over and reduce the heat slightly. Break an egg onto the centre of the pancake and spread the whites out towards the edges. Cook until the egg white is set. 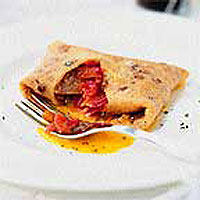 Add pieces of warm bacon and sausage (not too many or the pancake will burst) and a dollop of tomato relish to taste, then flip the sides and the ends over to cover the centre, making a nice square parcel. Serve immediately, turning the package upside down so that the edges are underneath, leaving a neat parcel of food to be tucked into.